“The sound and rhythm of the music brings to life the vibrancy of not only Zimbabwe but Africa to the hearts of those who hear it. We believe that our purpose for being here on earth is greater than itself.” GWERU-based acapela outfit Behold Music Zimbabwe is bracing for an action-packed couple of weeks that include an album launch tomorrow, while a concert with American Grammy Award nominees Committed is on the cards.Soon after the album launch at Gweru’s LFCC Hall, they will work with acapela pop group Committed, whose “Do You Hear What I Hear?” received a 2016 Grammy Award nomination for Best Arrangement, Instrumental or acapela. Also expected at their May 7 concert in Bulawayo is the SABC Crown Acapela Award Winners, JUST 6. In 2014 and 2015 they released “Nzira Nhete” and “Hachisvodi” respectively. “Behold produces a fusion of distinct African spiritual sounds of Shona, Ndebele, Tonga, and Swahili origin with contemporary Christian gospel music. Behold sings richly layered vocal harmonies, combining the intricate beat and rhythm of the motherland with the sounds and sentiments of Christian gospel music. “The result, a powerful sound that is pleasing to the ear and soothing to the soul. The music is deeply rooted in African tradition and culture but the message is universal, it’s the message of Jesus Christ. “The sound and rhythm of the music brings to life the vibrancy of not only Zimbabwe but, Africa to the hearts of those who hear it. “We believe that our purpose for being here on earth is greater than itself. That is why we are more than just a singing group. Our prayer is to reach out to both the local and universal community and in so doing better the society we live in,” Kucherera said. 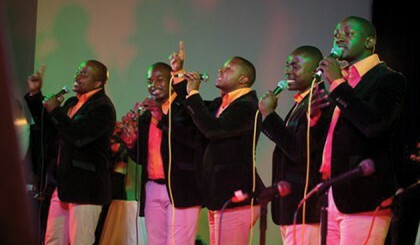 The 10-member group has performed throughout Zimbabwe at festivals, church gatherings, schools, and corporate and fundraising events. Kucherera said the group’s name reflected the impact and power of beholding. “We have heard the verse, ‘But we all, with open face beholding as in a glass the glory of the Lord, are changed unto the same image from glory to glory, even as by the Spirit of the Lord,’ (2 Corinthians 3:18) time and time again. By beholding we become changed. “But what does it really mean? God has made us as creatures with impressionable minds. In a nutshell, we are like sponges. We absorb what we immerse ourselves in. Whatever we focus on is what we become like, thus the phrase, by beholding we become changed. “Hence it is the desire of the group to influence what we absorb as Christians and it can be felt in the simple melodies which you will find yourself humming to long after you have heard them,” he added. The group members are Sakhile Ntini, Maxinne Chakabveyo, Karen Makiwa, Orpah Hwengwere, Gloria Maplanga, Ntando Moyo, Thabani Ngwenya, Pascal Chigango, Elvis Zhou and Tanatsiwa Madhakiwe. Kucherera expressed gratitude for the assistance rendered to them in their journey by two other gospel groups, Shower Power and Reunion. “It’s a well done album but I urge our fans to watch out for the track Jobho,” Kucherera said.